When Australia passed a parental leave law in 2010, it left the U.S. as the only industrialized nation not to mandate paid leave for mothers of newborns. Most of the rest of the world has paid maternity leave policies, too; Lesotho, Swaziland and Papua New Guinea are the only other countries that do not. 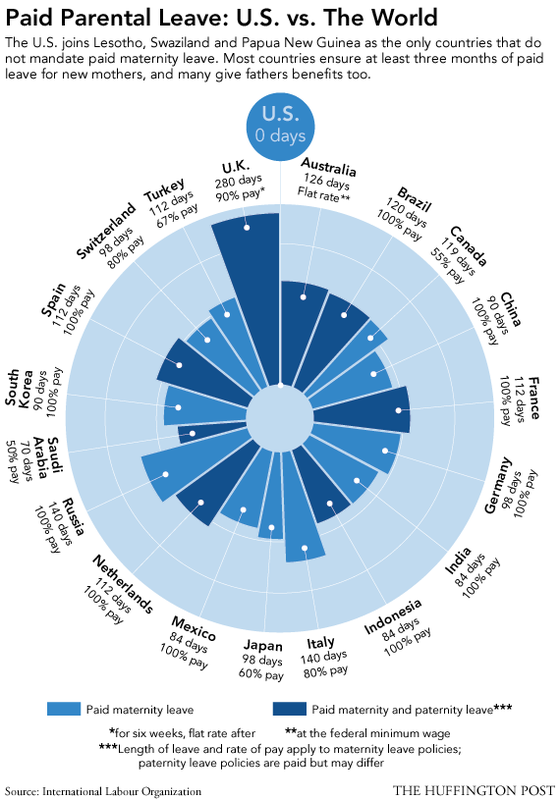 Many countries give new fathers paid time off as well or allow parents to share paid leave. New parents in the U.S. are guaranteed their jobs for 12 weeks after the arrival of a new baby, thanks to the Family Medical Leave Act of 1993, but they do not have to be paid during that time and exemptions apply for small companies. Only about 16 percent of employers offer fully paid maternity leave and many families take on significant debt or turn to public assistance around the birth of a child. As America's falling fertility rate raises economic concerns, working families may long to procreate in Sweden, where parents are given 480 paid days per child, to be shared between them and used anytime before the kid turns eight. Will the U.S. catch up with the rest of the world during President Obama's second term? Advocates are working to get a national law passed while some states are expanding family leave policies, the Atlantic reports. See a new White House petition here. In the meantime, certain companies understand that keeping new parents happy makes more sense than replacing them, which generally costs somewhere between 50 and 200 percent of a worker's salary. When Google lengthened its maternity leave from three months to five and made it fully paid, new-mom attrition fell by half. This story appears in Issue 38 of our weekly iPad magazine, Huffington, in the iTunes App store, available Friday, March 1.